For astronomers seeking superior equatorial control and the ease of a precision computerized GOTO system, the HEQ5 PRO SynScan is your answer. "The Three-star alignment accurately corrects for cone error and subsequent GO-TO accuracy was impressive." "I like these mounts, they are solid, well thought out and work quietly and effectively"
Sky-Watcher Pro mounts have been designed for use by novices and experts alike. These mounts provide extremely high precision tracking and have built in autoguider ports. This heavy-duty HEQ5 Pro mount is a smaller version of the sturdy EQ6 Pro mount. It is specially designed for observers who need the steadiness of the EQ6 Pro mount, but find the EQ6 Pro mount too physically demanding. 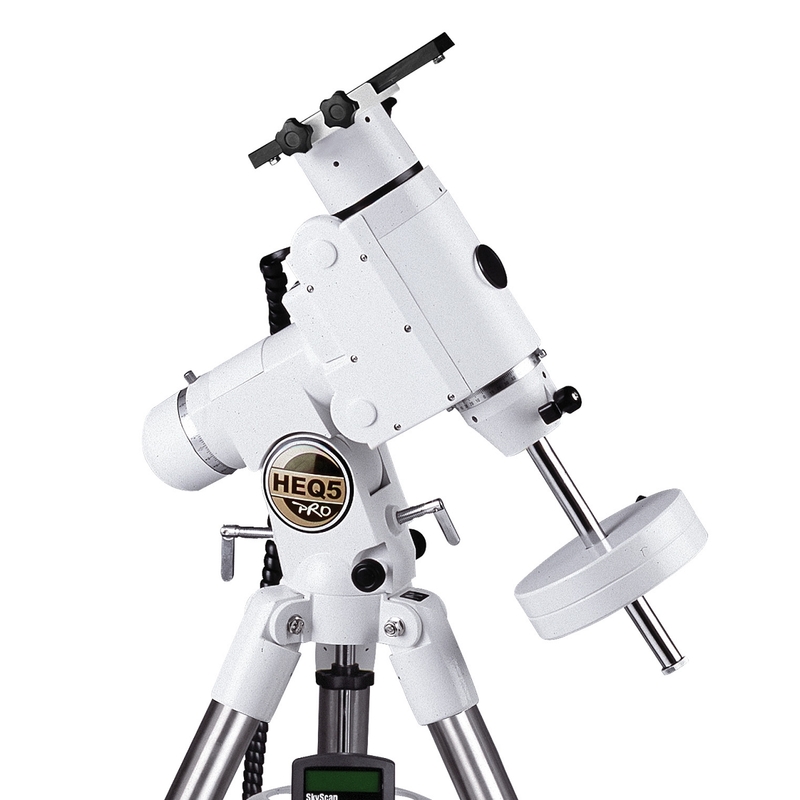 Designed for novice and experienced astronomers alike, the Sky-Watcher USA HEQ5 Equatorial GoTo Mount is built to similar specifications of their more robust mounts for those who are looking for something that is a bit more easy to manage without having to sacrifice performance. 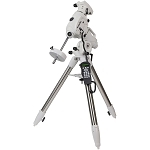 It features a hefty 30-pound payload capacity, a motorized mount head with the SynScan computer hand controller, a 1.75" stainless steel adjustable tripod, and a polar axis scope. The mount also has a Vixen-style dovetail saddle for mounting compatible telescope optical tube assemblies (OTAs) and accessories. The brains of the mount is the SynScan controller that is packed with an internal database of nearly 43,000 celestial objects from comets and asteroids to galaxies and nebulae. With multiple slew speeds and automatic tracking capabilities, finding and keeping subjects centered in the field of view is easy—whether you're viewing the fast-moving moon or much slower deep-space subjects. The included polar axis scope is installed through the body of the mount to make your initial polar alignment faster, easier, and more precise. 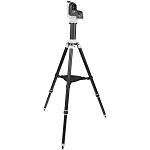 Stainless steel legs and an accessory tray that also doubles as a leg-locking spreader provide a solid and stable platform for all your gear with natural vibration suppression to ensure clear views even at high magnification. This mount head is also outfitted with two counterweights for precisely balancing your optical tube and gear so it will move smoothly without adding excessive load to the motors. Database 25 user defined objects. Complete M, NGC, and IC catalogues. Total 13,436 objects. This mount is a development of the Taiwanese optical giant Synta’s HEQ5 mount, and it incorporates a number of motor and gear enhancements as well as a computerised hand controller. This is known in the UK as the SkyScan, though the instruction manual insists on calling it the SynScan. Although it's just 4kg heavier than the Vixen and Celestron mounts on test, the HEQ5 Pro equatorial head and tripod feels far more substantial. 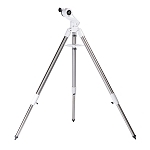 The 4cm (1.5-inch) diameter stainless steel tripod legs may not look as sturdy as the Celestron or the EQ6 Pro, but there doesn’t appear to be a lot of difference in stability. Plus, there’s no denying that it looks great: the striking white livery and clean lines flowing from the fully enclosed dual-axis drive system give it a high-tech, precision feel when it’s set up. With our test 6-inch Schmidt-Cassegrain telescope in place, we were impressed with the vibration damping time of just over a second. In common with the EQ6 Pro – the HEQ5’s sibling mount – and Vixen mounts, the counterweight shaft retracts into the body of the mount, which is a real plus when it comes to transportation and setup. Another factor that we liked about the HEQ5 Pro is the built-in polar alignment scope, which makes it easy to get the polar axis of the mount precisely parallel to the Earth’s axis of rotation. While you can still get good Go-To accuracy without paying too much attention to this important setup procedure, tracking will be impaired without it. When you look through the polar scope, there’s a clearly defined grid that allows you to offset easily and simply from Polaris to the true north celestial pole. The menu structure of the SkyScan is easy to navigate on the two-line, scrolling LCD screen, while the alignment procedures with one, two, or three stars, are easy to implement. The three-star alignment accurately corrects for cone error, and subsequent Go-To accuracy was impressive: we found our test objects in the centre half to third of a 160x eyepiece field wherever we looked in the sky. Like the Celestron, remote control is made easy with the RS-232 serial port on the base of the handset; you just have to buy a cable to connect it to a laptop or desktop PC. The SkyScan may not possess the capabilities of Celestron's NexStar system, but the quality engineering of the HEQ5 Pro’s bearings and gears make it a quieter, better choice for imagers – especially since the hand control supports periodic error correction and autoguiders. This review appeared in the June 2006 issue of Sky at Night Magazine.